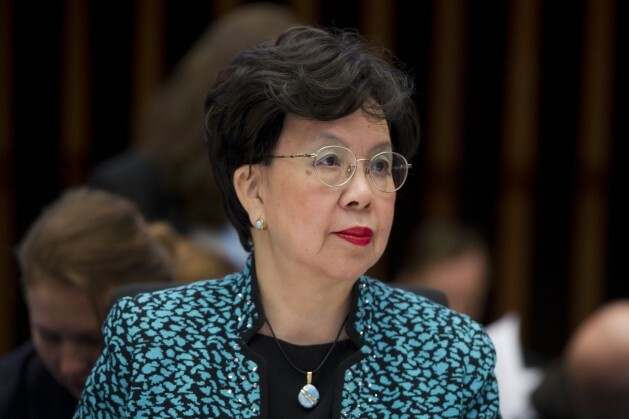 Margaret Chan, Director-General of the World Health Organization (WHO), during the WHO Executive Board's special session on the Ebola emergency. Credit: UN Photo/Violaine Martin. UNITED NATIONS, May 24 2016 (IPS) - Putting economic interests over public health is leading the world towards three slow-motion health disasters, Margaret Chan, Director-General of the World Health Organization’s warned the world’s health ministers on Monday. Changes in the world’s climate, the failure of more and more antibiotic drugs and the increase in so-called lifestyle diseases caused by poor diet and exercise, are all growing health disasters related to the prioritisation of the economy over public health. “These are not natural disasters. They are man-made disasters created by policies that place economic interests above concerns about the well-being of human lives and the planet that sustains them,” she said. Chan’s warnings were part of her speech at the opening of the 69th World Health Assembly in Geneva. Some 3500 delegates from the WHO’s 194 member states will participate in meetings at the assembly about some of the world’s most pressing health issues from May 23 to 27. During her speech Chan also acknowledged the world’s many recent public health successes, however overall she argued that advances in health services and systems could not keep up with the global changes which mean health threats are increasingly traversing borders. “We are on the verge of a post-antibiotic era in which common infectious diseases will once again kill." -- Margaret Chan, WHO. “The burning of fossil fuels powers economies,” said Chan, contributing to changes in climate, which have led to the spread of mosquito-borne diseases, as well as to air pollution which the WHO says kills millions of people every year. However antibiotic resistance may be the problem that has the global health community most concerned, threatening to throw the world back into the dark ages of health care said Chan. The over-prescription and incorrect use of antibiotics has led to the once wonder drug failing with increasing frequency. Chan noted that infectious diseases are also becoming more volatile, and that the global health system was not as prepared as it should be for a true global health emergency. She pointed to examples of recent surges in infectious diseases such as Ebola, Zika, Dengue, Yellow Fever and Chikungunya. She noted the connection between Zika virus and microcephaly had taken the medical community by surprise. Chan reserved some of her harshest criticisms for the world’s failure to prevent the current re-emergence of yellow fever in Africa, an outbreak the WHO is currently monitoring closely. She described the conditions in urban environments fueling the current outbreak as a powder-keg. “For more than a decade, WHO has been warning that changes in demography and land use patterns in Africa have created ideal conditions for explosive outbreaks of urban yellow fever,” she said. Chan noted that beyond the failure to control mosquitos, the re-emergence of yellow fever also reflected a failure to adequately vaccinate against the disease. “The lesson from yellow fever is especially brutal. The world failed to use an excellent preventive tool to its full strategic advantage,” she said, noting that there has been a safe low-cost yellow fever vaccine available since 1937. Chan’s speech is not the only recent stand taken by the medical community showing increasing frustration with the current state of global politics. Chan also alluded to the medical community’s increasing frustration with the deteriorating conditions of warfare which have seen hospitals bombed, in violation of humanitarian law. “It also falls to the health sector to show some principled ethical backbone in a world that, for all practical appearances, has lost its moral compass,” she said. However the successes that Chan highlighted, proving the potential of the world’s health system to address global challenges. also showed that another reality is possible. “We can celebrate the 19,000 fewer children dying every day, the 44 percent drop in maternal mortality, and the 85 percent of tuberculosis cases that are successfully cured,” said Chan. She also highlighted the 60 percent decline in malaria mortality in Africa, showing that the fight against mosquito-borne diseases is having success, in at least one area. I wouldn’t trust the Money Power’s tool organisation (W.H.O) nor any of their other organisations – The World Bank, the IMF, the U.N. – nor anything they say. Nor their false notion of ‘Global Warming’ (its cooling not warming and they have the figures altered). Depopulation is the Money Power’s goal in their planned New World Order in a One World Government. No thanks, we the people are not stupid. What is ‘climate change’ mean?? The climate changes every day, has since the beginning of time and always will and its got nothing to do with humans – its the natural, dynamic sun cycles. There has always been global warming and global cooling, ice ages and the like. This speech is in our view a very elequant conclusion to the current state of affairs. However, it appears that disasters have to happen first before proper funding is made available – notably the Zika pandemic carried by Aedes which also spread yellow fever here in W. Africa. We hope that the WHO will create a fast lane admin procedure to approve new products that have been used in the field, such as ours, an efficient low cost larvicide that deals also with waterborne pathogens.